The latest Bureau of Labor Statistics report on Job Openings and Labor Turnover Survey (JOLTS) shows that the number of new job openings decreased by 80,000 in October to 2.5 million. At the same time, however, the number of unemployed workers increased by 558,000 to 15.7 million. As a result, there were 13.2 million more unemployed workers than job openings in October, or 6.3 job seekers per available job (see chart below). 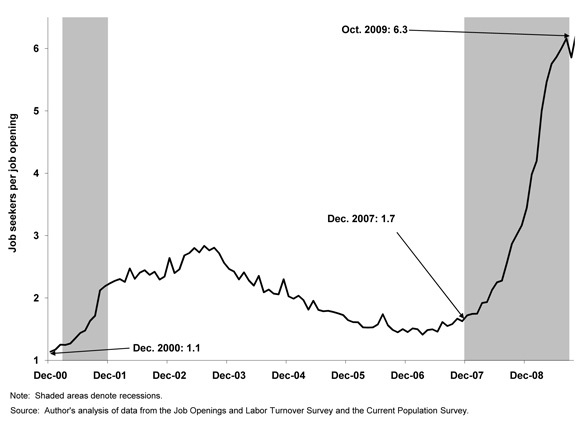 Given the large number of job seekers per job opening, it is unsurprising that the jobless are getting stuck in unemployment for long periods and that the labor market is seeing record rates of long-term unemployment. The job openings situation is trending in the right direction—in the first quarter of this year, job openings declined an average of 197,000 per month, but in the latest three months surveyed, openings increased by an average of 33,000 per month (bolstered by an upward revision this month of 106,000 to the September data). But even though job openings are stabilizing, they are doing so at very low levels. The pre-recession high was 4.8 million job openings in June 2007; in October 2009 there were just over half as many openings at 2.5 million. Thanks largely to the American Recovery and Reinvestment Act, layoffs are moderating, but the JOLTS data show that job openings and hiring remain extremely depressed. Until job openings and hiring revive, job growth cannot resume and unemployment will continue its upward climb. We must act boldly to create more jobs. To this end, the Economic Policy Institute has detailed a five-point American Jobs Plan that will create or preserve at least 4.6 million jobs in the first year, and can be paid for with a modest financial transactions tax that would recoup the entire cost of the plan within 10 years.